DonвЂ™t even pretend you donвЂ™t know what IвЂ™m talking about. You show up for a date and you just decide you NEED to be able to show the real-life version of your date to your friends later. But for some reason, itвЂ™s considered socially awkward to snap a pic of your date on your first meeting. (Actually, IвЂ™m not even sure when itвЂ™s appropriate to take a picture of a date. IвЂ™m pretty sure there are no existing photos of my exes and/or dates.) Why do I want these pictures though? Proof: Whether your date was absolutely gorgeous or вЂњnot quite as pictured,вЂќ sometimes a girl just needs some proof! In the best case scenario, you want to brag. In the worst case scenario, you want your friends to know youвЂ™re not exaggerating. Identification Purposes: Sometimes, you want to snap that pic real quick and text it to a friend so they have a photo for the police. вЂњLast seen withвЂќ is so much more effective when you have a picture to go with a name. Google Image Search: IвЂ™ll be honest. It all comes down to this one really. Of course I want to run his picture through Google Image Search and see if it pops up anywhere! 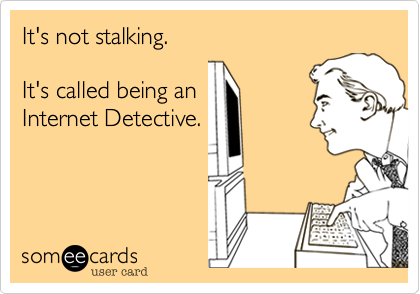 If I havenвЂ™t already managed to find my dateвЂ™s Facebook page, Twitter handle, LinkedIn account, and every other document on the internet (IвЂ™m a internet detective, what can I say? ), I want to be able to dig up some more dirt! Arrest records can be tricky to get sometimes, images make that much easier. Keep in mind what I’m asking for here is different than asking for a picture as soon as you start texting each other. That’s a different thing entirely (and not ok). I vote we start campaigning immediately to make first date picture taking normal. ItвЂ™s only taboo if we all keep playing into the concept that itвЂ™s вЂњweird.вЂќ WhoвЂ™s with me? Tags: dating, identification, pictures, proof. Bookmark the permalink. Think I would be scared if a girl wanted to take pictures of us on our first date.